It's Monday morning here, so it must be Superbowl time back in the US. We can watch it tonight on replay. It will only take about 1 1/2 hours. No commercials! Oh, how our perceptions change! On Saturday it was 32F when we got up. By 11:00 it had warmed up to 42F. Lindy asked how long it would stay warm so that we could ride comfortably. I don't think I ever would have thought of sunny and 42F as being warm for riding. It must be that funny energy drink we use, it affects our senses (or is it sensibilities?). We went on a relatively short ride, just exploring the local roads. We headed east and made left, right, straight decisions as we went. Funny, most of the roads that go up the hills (mountains) are dead ends. Problem is, we were quite warms climbing the hills at 9-12 KPH, but it was COOL coming back down. 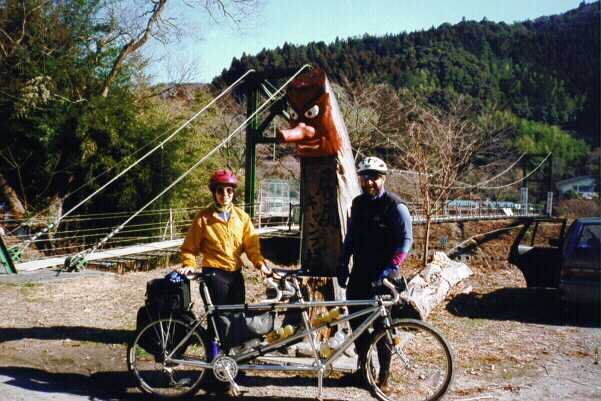 We also found our first almost tandem roller since we've been in Japan. The hills were just a little too steep (or too long). We would spin out at the bottom, and then just barely make over the next crest without dropping into granny. It was fun though, especially since the route for the day was "let's find some new roads". Yesterday we rode up to a lake that wasn't there. It was a very scenic ride up into the hills. On the map it showed a lake about 1.5 KM long with a small road going around the backside. As we were riding along Lindy thought she saw a lake below us but I said no, that's just a small stream. So we kept riding. One thing about riding around here: If you head west you have a tailwind for the ride home, if you head north you have downhill for the ride home. We were going northeast, good compromise? 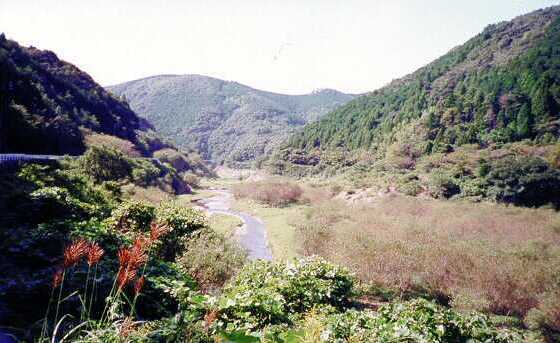 Even though we were following a small river valley, with very steep sides, we were still going distinctly up. After another couple of kilometers we stopped at a temple to use their facilities. A local who lived across the street came over to talk to us. We looked at the map and found that, yes indeed, the stoker is always right. That was the lake. When I said it had no water, the fellow laughed and said that in the summer, with the rains, it is a lake. At his recommendation we continued up the river and came to a pair of campgrounds. They looked very American, complete with Totem Poles and cabins. A little bit further on we decided it was time to turn around for the easy downhill ride home. We took the small road around the back side of the not a lake. Mistake! The pavement stopped about one third of the way around. It turned into very rocky single track complete with small hills and sharp turns. My hands cramped up toward the end of that section from holding on so tightly. I don't think we like off road riding. Part of the "thrill" was the fact that on the left side of the trail was a one meter high iron pipe fence which was all that stood between us and a 50 meter drop into the not a lake. Since I am afraid of heights, which did not add to the enjoyment! Other than that, it was a great ride. Part way down the hill those westerly winds came on. The last part of the return ride was flat heading to the west, just like a bad ride home after work, 18-20 kph into the wind on level terrain. Which reminds me, we had an all time record for our ride home from work Friday. We averaged 16.6 kph for the 13.5 kilometer ride with no hills. How's that for the "how slowly can you go at full effort contest?" BTW, we have been using the Specialized self-sealing tubes, and they seem to actually work. We have had pinch flats that just go a little soft. Pump the tires back up and they are fine. I was not a believer but figured that where we would be riding we could use whatever tricks we could find. We brought lots of spare parts with us, knowing how difficult it would be to get replacement parts, and also how expensive things are here. Other than wearing out one tire, and burning out two headlight bulbs (they each lasted <2 hours) the spares are gathering dust. Oh well, better safe than sorry. If any of you Hobbesians are heading this way, we have warm showers and an inflatable mattress for the guestroom available. Maybe we could even start a tandem club here!